Nothing fantastic happens in La Granja, a relentlessly dour feature debut by writer/director Angel Manual Soto that should have the official Puerto Rico Tourism Company up in arms. Set in Puerto Rican neighborhoods that are far off the beaten path for daytripping tourists and foreign nationals, La Granja follows three bleak stories, all related to the drug trade on the Caribbean island, as they crisscross and intermingle, in a style that's reminiscent of the work of Guillermo Arriaga (21 Grams, Babel). Divided into chapters, each tale revolves around a quietly desperate individual: a nurse who wants a baby; a boy who wants to be a boxer; and another boy who is already deeply involved in the drug business. The movie starts on a frank note of sexuality, which is as passionate as any of the characters get for quite a while. The big challenge the movie presents is that none of the lead characters are inherently intriguing; instead, they are beaten down, barely exhibiting much sign of life. Thus, it's not entirely clear why Ingrid (Amneris Morales), the baby-seeking nurse, wants a child. She is in her thirties, perhaps, and, perhaps, feeling that time is running out for her to have a family. Unable to conceive a child on her own, she attempts to steal one from a drug-addled mother who enters the hospital in a state of incompetence. Perhaps Ingrid feels justified in doing so, but the movie prefers to keep that private. 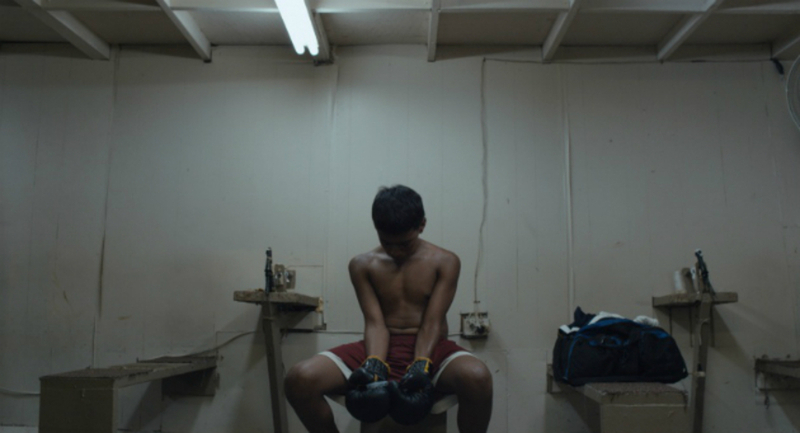 Santito (José Colón), the boy who wants to be a boxer, is a merciless sort, who has no empathy or fellow feeling for other people. All he knows is that he wants to be a boxer. Does he dream of using that skill to escape his dire circumstances? Does he imagine that he will gain glory or fame? Or is he simply responding to what the adults in his life tell him to do? Your guess is as good as mine. Lastly comes Lucho (Henry Rivera), the young drug mule. Again, he appears to be a product of his environment; like the others, his personal motivations are never discussed. His situation appears to be more privileged than it is for Santito, yet like him, Lucho keeps to himself. Neither appears to have any friends, and each appears to be caught in in an inexorable wave, carrying them from birth to death, one a little poorer, one a little more monied. What does it matter when you don't have control of your own life?